In my blog post back in July 2013 I looked at the 17 Shadow Play winning performers in North America, about halfway through their 2yo season, and what their pedigree might tell us about possible golden crosses. Those North American Shadow Play horses were: Book Babe, Shadowbriand, Alibi Seelster, Shark Festival, Reasonable Force, Brookdale Shadow, Lady Shadow, Play It Again Sam, Performing Art, Shadversary, Twin B Spy, Skippin By, Shadow Place, Courageous C, Yoselin Seelster, Nefertiti Bluechip, and Arthur Blue Chip (the only one whose dam doesn’t carry any No Nukes/Oil Burner/Shadow Wave in her pedigree). Out of interest, how have those horses tracked in the past few seasons? I’ll follow the same order as above, which I think was pretty random or may have been their rating on earnings at that stage – to be honest, I don’t recall. I haven’t included their best times or race details, this is just an indicative account. As a sire of horses that can show up but go on to improve, Shadow Play is interestingto follow. His pedigree shouts out to me, so I am not surprised by him proving longer term success rather than short-term 2yo brilliance. So many other factors come into it, of course, but as breeders we need to lay the potential, the springboard. 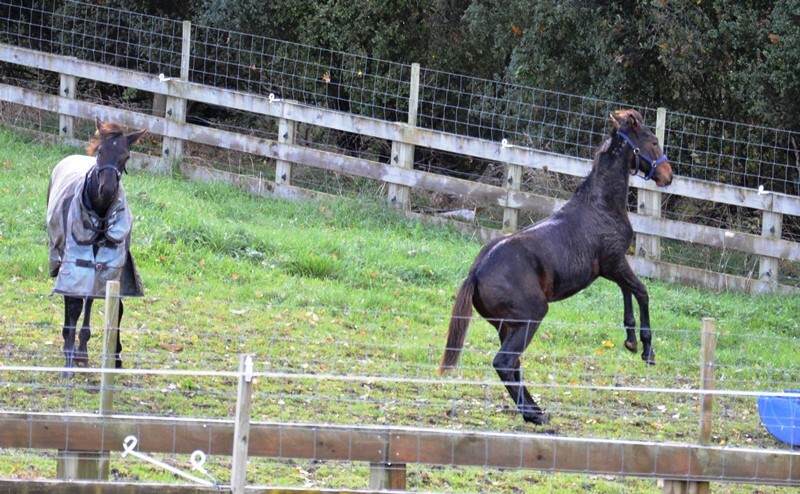 Shadow Play can add a lot of genetic value to the right mare. He may or may not be given a chance in New Zealand, but he is getting a reasonable chance in North America and Australia. And the list above shows how it can pay off. Your own thoughts always welcome. Sorry about the lack of blogging – still coming up to speed from being unwell. The Australian yearling sales have started, and here in New Zealand we have only a couple more weeks before the Australasian Classic at Karaka (22 February) and the Premier at Christchurch (23 and 24 February). This is a pressure time for all preparers, but to be honest if the ground work hasn’t been done then it is too late to make a silk purse from a sow’s ear. The canny buyers, usually trainers, will be focused on the underlying quality of the yearling, its conformation and pedigree, and what they see in their mind’s eye it will be like in another year or so. Those are not things you can turn around in the last two weeks. 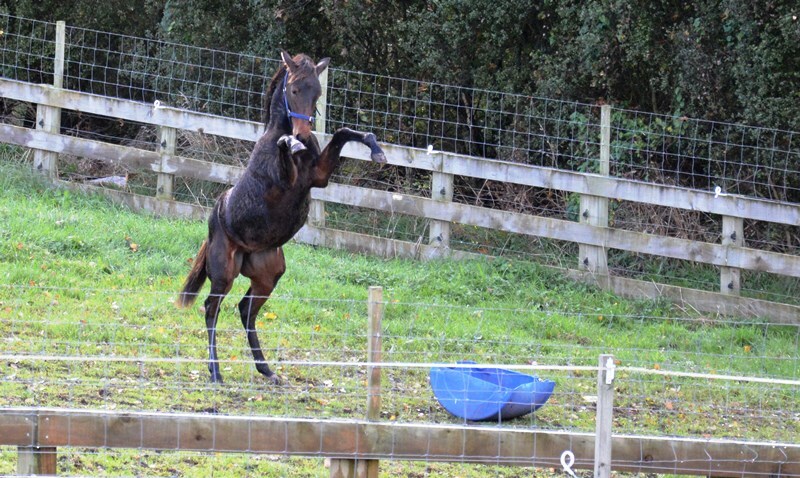 Isa Lodge (the name Kym Kearns and I go under for our breeding) has two fillies and a colt headed to Karaka. All three have been raised at our home base, and it has been a pleasure to watch them develop. 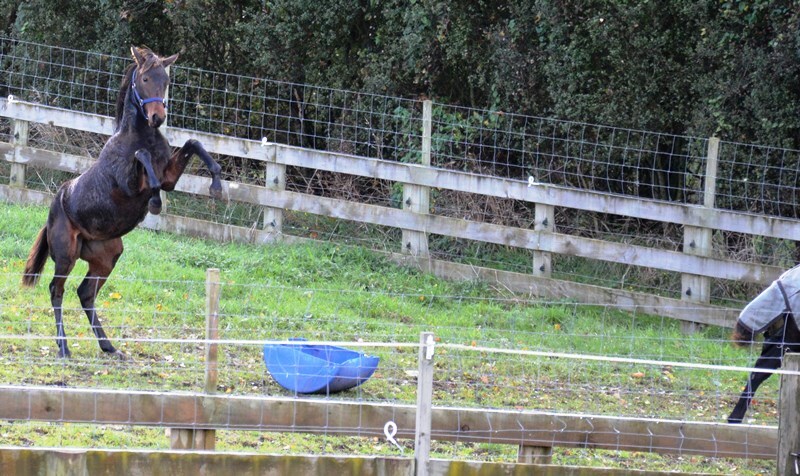 As always, Kym has done the hard yards of the preparation, and the horses reflect her skills and dedication. We are really pleased with them. 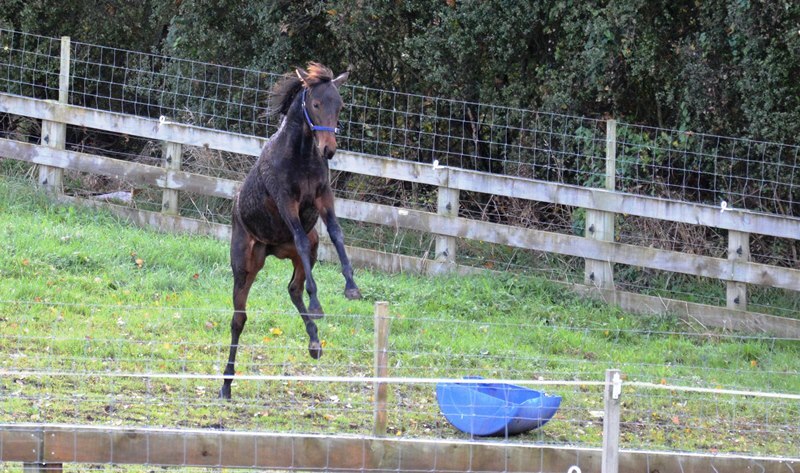 Lot 100 is a Shadow Play colt with heaps of character from my lovely mare The Blue Lotus. I love this colt. He is very sociable. He entertains himself with made up games, he’s intelligent and he can’t wait to have something more to do. 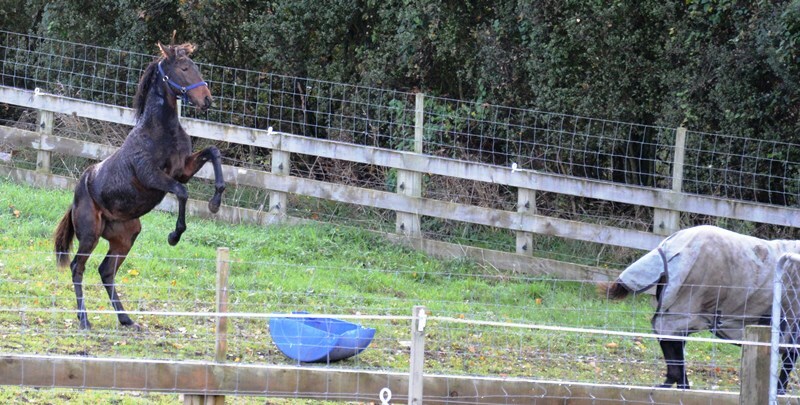 He has a real zest for life, and my guess is that he’ll love racing. And that’s half the battle. Lot 133 is a Rock N Roll Heaven filly from my top mare Zenterfold, so she is a half-sister to Tintin In America. This is the only filly from Zenterfold that has been offered at the yearling sales – she is genuinely for sale – and I think she’s a really nice racing proposition as well as having longer term broodmare value. She’s built like a brick sh**house, and has really quick reflexes. Very typical of the good Heaven fillies I’ve seen on the track, and potentially an early type. Lot 115 is a Majestic Son filly from Kym’s mare Toggle. She’s an incredible yearling, lovely temperament, inquisitive, takes everything in stride. She’s a showy type in terms of looks, with a dark mane and a blonde tail. She seems a very professional youngster, well grounded, sensible. She’s got a really good trotting family behind her, and Majestic Son has given her a nice length and more height than her dam. With the demise of the Harness Weekly, we’ve done almost no advertising this year – we feel many of the publications come out after the key buyers have long-listed and even inspected their preferred yearlings. We’ve focused more on having a good product ready to be inspected, hands-on, when buyers and trainers wanted to see them. 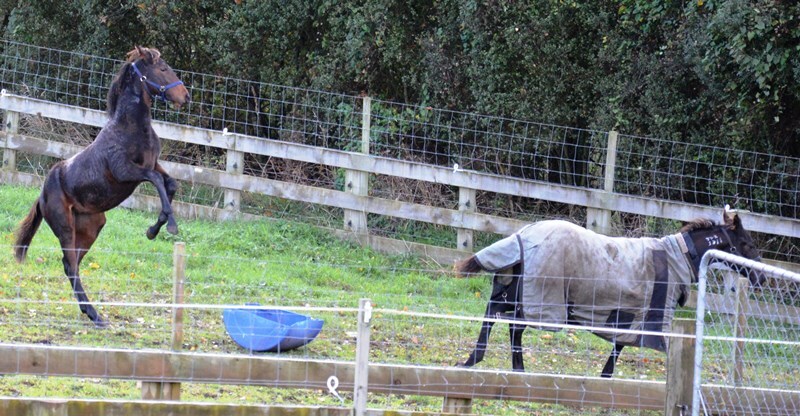 We were delighted that PGG Wrightson again allowed smaller breeders in the Cambridge area to be part of the “buyers bus tour” of the major preparers/vendors in the Waikato area, by adding the Cambridge Trotting Track as a tour stop for presentation and inspection. Almost all the top trainers were on that “bus tour”, and our lots did us proud. Below are the posters we have developed for the yearling sale day promotions. It’s been pouring with rain most of the day, and our four weanings have been stoically waiting it out. Then at last a break in the weather! 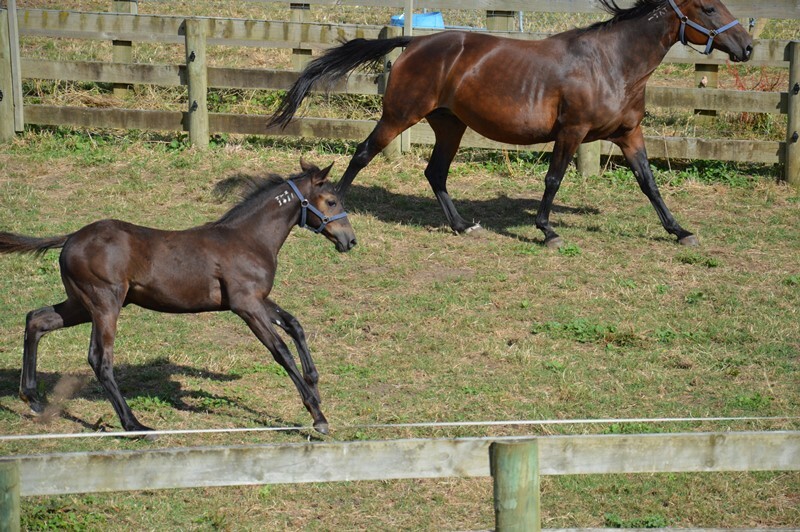 And oh boy, the Rock N Roll Heaven filly just couldn’t hold herself back. How could the Shadow Play colt not be in awe? Oi, I said look at me! Can’t hold it much longer!